Purakelp is manufactured from bull kelp (Durvillaea potatorum) from the pristine waters of Southern Australia using a unique cold digestion process to retain the nutritional properties of the kelp. Purakelp is a natural organic plant growth stimulant and soil revitalizer. Purakelp contains a wide range of trace elements, amino acids, plant growth stimulants and enzymes. 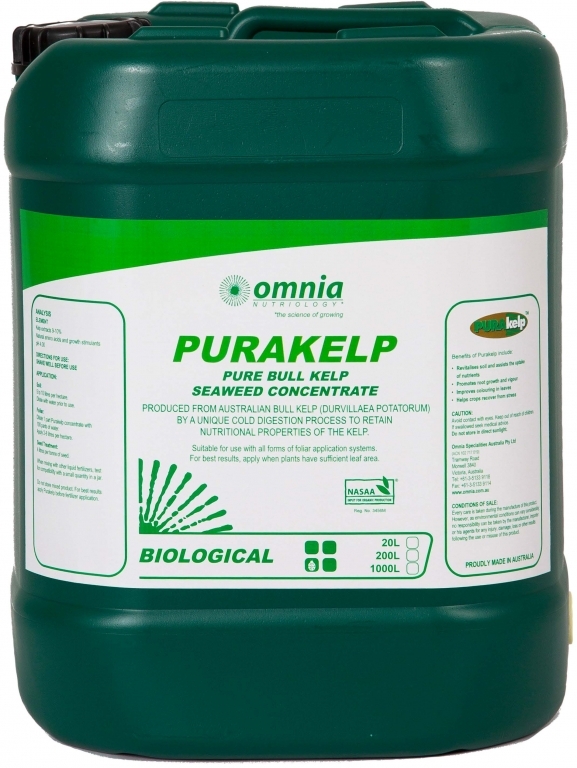 Purakelp is highly effective for use in foliar applications and can also be used as a soil drench or seed treatment and is a suitable input for organic farming. Suitable for foliar applications and soil drench or seed treatment. 5-10L per hectare. Dilute with water prior to use. Dilute 1 part Purakelp concentrate with 100 parts of water. Apply 2-8L per hectare. 4L per tonne of seed. Purakelp is a NASAA-Certified organic product of choice.